libguestfs is a library for accessing and modifying virtual machine disk images, and a lot of related tools such as guestfish — an interactive shell, virt-cat and virt-edit — for editing files inside VMs, virt-df — for displaying free disk space, and virt-inspector — for inspecting the contents of VMs, and much more. OCaml is an advanced programming language with performance similar to C. The Fedora OCaml project brings the latest OCaml compiler and over 70 libraries to Fedora. The Fedora MinGW special interest group packages a complete Windows cross-compiler and hundreds of libraries, so you can instantly cross-compile most software to Windows. top -like utility for showing stats of virtualized domains. Many keys and command line options are the same as for ordinary top. It uses libvirt so it capable of showing stats across a variety of different virtualization systems. df for virtual guests. Run this on the host / dom0 to find out how much disk space is used and available on all partitions of all the guests. 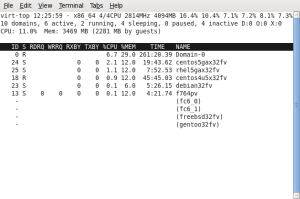 Virt-tools is a suite of tools for managing virtual machines, including virt-uname, virt-ifconfig, virt-ps, virt-uptime, virt-dmesg, and more. At the moment you have to compile from source from the virt-tools code repository. Virt-p2v can migrate physical machines to virtual guests (P2V), virtual guests to virtual guests (V2V) and virtual guests back to physical machines (V2P). Amongst other features it lets you resize partitions, install paravirt drivers and change how the virtual hardware is configured after migration. Virt-what is a shell script to detect if we are running in a virtual machine. It can detect a number of different forms of virtualization. For more up to date news, please see my blog. library for accessing and modifying guest (virtual machine) disk images (2009/03). rpmdepsize, visualize the size of RPM dependencies (2009/03). febootstrap, a tool for bootstrapping a Fedora system (like Debian debootstrap) (2009/03). Direct access to I/O ports from the command line or scripts (2009/03). Suggest BuildRequires automatically for rpmbuild (2008/11). You can find more news on my blog (2008/07). How to get your code and patches into open source projects (2008/07). ocaml-bitmatch has been renamed bitstring (2008/07). Virt-mem monitoring tools for virtual machines (2008/06). Augeas bindings for OCaml (2008/05). Bitmatch - bitstring matching for OCaml (2008/04). OCaml newt - newt text window system bindings for OCaml (2008/03). PortableXDR An external data representation (XDR) library for Windows and Mac OS X. (2008/01). Porting virt tools to Windows. My experience porting the virt tools to run as native Windows applications (2007/11). Libunbin is a library / toolkit for safely reading binary things. (2007/10). Nagios-virt is a tool for configuring virtual hosts for monitoring by Nagios. (2007/09). Virt-p2v is a tool for physical to virtual machine migration. (2007/09). Virt-top is a top-like utility for displaying virtualization stats. We aim to make as many command line options and key combinations as possible the same as for top, to make the tool familiar for systems administrators. Using CIL to analyze libvirt. CIL is a library for doing static analysis on large C projects. In this document I describe how I used it to analyze libvirt. (2007/07). Xavierbot is an OCaml toplevel for IRC. This is a teaching tool to allow people learning OCaml and their teachers to cooperate in an IRC chat session, trying out different OCaml commands with a shared toplevel (2007/07). OCaml bindings for libvirt (2007/06). Xen hypervisor calls from OCaml. Make Xen hypervisor calls from OCaml, macros to allow binary and bitfield structure packing, and ioctl and mlock bindings. (2007/06). Stress-testing Xen on Rawhide. Scripts and tips for stress-testing Xen. (2007/05). XDR allocate, free and destroy. How and when to use XDR, with particular emphasis on xdr_free and xdr_destroy, with code samples. (2007/04). How SunRPC handles reconnection. We tested SunRPC reconnections when the transport was UDP, TCP and Unix domain sockets. (2007/02). How to run SunRPC and XML-RPC over various authenticated and encrypted transports. On this page I'm looking into how to do remote procedure calls (RPC) from C in a secure way. We settled at looking at two popular RPC mechanisms (SunRPC and XML-RPC) and how to transport those over GnuTLS (SSL, TLS) and ssh. For XML-RPC, running over SSL is relatively straightforward because almost any competent library supports it. Running over ssh is more difficult, but it is likely to be more useful for users since they likely already have the ssh infrastructure set up. SunRPC is much trickier because there is no standard way to run it over a transport other than Berkeley sockets. However with the SunRPC implementation within glibc you can write your own transport (other than the standard UDP and TCP). (2007/01).